Interim head coach Ed Orgeron is taking the LSU Tigers to new heights. Gripped in the throes of player, fan and intra-school turmoil, in September, Louisiana State University surprisingly terminated its longtime head football coach, Les Miles. In many corners beloved, in other venues reviled, in all places respected and liked, Miles proved to be a sort of Bayou Hamlet torn apart by his conflicts. Expressive and hyper-animated, often times even eccentric on the field, he found himself confounded and tongue tied in press conferences off it. In the locker room and during games, he earned the love and maximum effort from his players, while, at the same time, he appeared flummoxed in his decision making and conflicted in his strategies. A magnificent recruiter famous for having corralled All-Pro NFL quality talent within Tiger Stadium, he also drew massive criticism for being unable to exploit it while those players wore the purple and gold. Bedraggled in a sluggish 2-2 start involving one quarterback change, which was controversial only because it had taken so long, and two devastating losses, Miles finally succumbed to the arrows of fan discontent amidst a sea of troubles gradually distanced from years of good fortune, now near forgotten. Miles himself had been brought in on the heels of the departed Nick Saban — who had been glorified for his returning a national championship to Louisiana after an absence of 40 years, but who was also vilified because his personality was considered too curmudgeonly, too gruff, for the loquacious comme ci comme ça attitudes of Louisianans. And so it seemed that epilogue was prologue as Saban’s winning had not been enough to overcome his boring stiffness, while Miles’ eccentrically exciting energy was not enough to overcome his failure to win every game he should have. Enter Ed Orgeron, the man designated to replace Les Miles as interim head coach. Born and raised in Lafourche Parish, a true Cajun, Orgeron had worked his way from South Lafourche High School to play college ball first at LSU and then at Northwestern State in Natchitoches. He then became a college coaching assistant at programs such as Arkansas, Miami, Syracuse, USC and Tennessee, but he also immersed himself along the way in the Louisiana lower division college circuit with positions at Northwestern, McNeese and Nicholls, and he earned pro experience with the New Orleans Saints. Perhaps most notably during the course of his travels, Orgeron gained important mentoring from coaching legends Jimmy Johnson and Pete Carroll. He would go on to be head coach at Ole Miss and interim head coach at USC. While his tenure at Ole Miss was mixed and ultimately unsuccessful with 10 wins in three seasons, it did keep Orgeron deeply entrenched in the regional recruiting environment, one of the richest in the nation. However, during his time as head coach at USC, Orgeron fared much better and — after facing circumstances very similar to what he has encountered this year at LSU, such as taking over mid-year following the team’s second loss of the season — he went on to post an overall 6-2 record. At that time, as the season came to a close, Orgeron faced the same quandary of restoring confidence and success to a major college program, while at the same time realizing that his efforts might not be rewarded. And indeed at the end of the season, despite USC’s return to winning, the school decided not to retain Orgeron but instead hired a coach with connections to the area and school. Aside from being just “football” it was also plain that USC was image conscious of what a USC head coach should appear to be, and Orgeron’s passionate demeanor and large frame intertwined with his raspy, rough, thick Cajun accented voice just did not fit the Los Angeles mode. And then USC’s loss became Louisiana’s gain as LSU hired Orgeron for the 2015 season. Aside from his recruiting prowess, Orgeron’s expertise had supposedly been in improving line play at the various schools where he has coached. 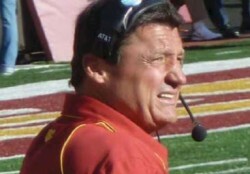 However, judging by the way the LSU Tigers’ offense, which had been a particularly egregious failing on the part of Miles, opened up its playbook after Orgeron took it over, it is likely that he had gathered a great deal of knowledge about running offenses in general, perhaps especially from his time watching and learning from his old mentor, Pete Carroll at USC. After impressive wins out the gate, featuring LSU’s full panoply of pro-ready talent — such as Leonard Fournette, Derrius Guice, Darrel Williams, D.J. Chalk, Malachi Dupre and Travin Dural — running effectively behind the Tigers’ huge offensive line and passing via a mix of four wide receiver sets and halfback screens, it seemed that USCs’ dominating offenses of the prior two decades had been magically transferred to Tiger Stadium. Rather the truth was that offensive coordinator Steve Ensminger, guided by Orgeron, dialed up a variety of play calling using crossing routes and a clever mixture of short outs peppered between deep passes, all while leaning on the Tigers’ new transfer quarterback Danny Ettling and what may very well be the nation’s very best stable of running backs. All of a sudden everything clicked. All of a sudden everything made sense offensively. And unlike USC, Orgeron is the walking, talking epitome of the culture and people and state who are cheering him on. Here, in Louisiana, his voice, his style and his life resonate. In doing all this, Orgeron has proven to be more than the traditional dedicated interim coach, restoring stability when it was needed, a calming hand to right the ship until a new captain could be brought on. With Orgeron it became clear quickly that LSU would not be surrendering its season or SEC title hopes. By the time this article emerges, the LSU administration may very well be facing a very difficult decision, whether to look to the future by looking elsewhere for the next big college hire with the right image, or to stop and realize the future is already here.